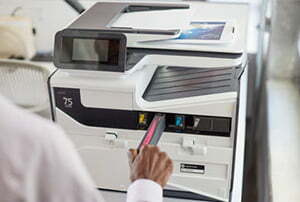 Each photocopier manufacturer produces either toner or ink for their devices to print with. Every photocopier has a specific type of toner or ink which is ‘compatible’, so you have to use the correct brand’s toner to ensure that the printer works and that quality is maintained. Laser printing technology uses toner. Toner is a powder which is used to form the images and text printed on paper. It relies on electrical charges and heat to create the prints. Toner is used in the photocopying process for: Ricoh, Lexmark, Toshiba and Sharp photocopiers. Each of these photocopiers use Cyan, Magenta, Yellow and Black toner to create the photocopies or print-outs requested by the user. In contrast, inkjet photocopiers spray fine droplets of ink onto a sheet of paper. The ink is sprayed using print heads. HP PageWide devices use ink to transfer the photocopied image onto paper. These printers rely on Cyan, Magenta, Yellow and Black ink to create the images or text. RISO duplicators use a patented method of transferring ink to paper, which involves the use of drums and masters. RISO duplicators do not use CMYK ink, instead they use 21 standard colours and can create special order-made colours to tie in with branding guidelines. As the largest RISO dealer in Europe, Midshire is able to supply the complete range of RISO photocopier supplies. How do I change my photocopier ink and toner cartridges? The first thing to remember, is photocopier toner is expensive, in fact gram for gram, it is more expensive than gold! Therefore, it is advised that you wait for your toner cartridges to become completely empty before replacing them. We advise customers to even give them a shake once they are right down to the lowest level, this will release some additional toner powder in the cartridge and will allow you to get a few more prints out. If one is empty, just replace that one, don’t replace all 4 cartridges at once! To replace the cartridge, simply remove the empty cartridge, and insert the new cartridge in its place. If you were already printing a job, then the printer should resume where it left off. We have written a detailed blog about what to do when toner is low on your photocopier, so if you want more help, have a look there. As part of our Managed Print Service, all Midshire customers have OneStop print management software installed on their devices, which monitors the toner levels. Once the toner falls below 25% full, OneStop automatically re-orders toner and it is dispatched to the customer, to ensure they always have toner ready for replacement. If a customer doesn’t have OneStop, or they require more photocopier toner for a large print job, then they can easily get in touch with Midshire via either through our Customer Support Portal page or by calling: 03332 413 434. Our warehouses based in Manchester and West Bromwich stock all types of machine toners and inks, including RISO Inks, masters and drums. The UK government have recently passed legislation which means that all toner and ink cartridges must be disposed of responsibly. Midshire has established free Toner Recycling Scheme for all our customers. 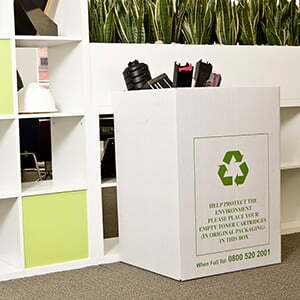 This hassle free service works in partnership with Effective Consumable Solutions (ECS) Ltd and their initiative – The Greener Side and enables all Midshire customers to recycle their unwanted toner and consumable parts in line WEEE guidelines, completely free of charge. 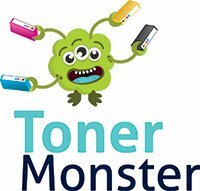 In partnership with ECS, Midshire has recently launched Toner Monster – a service which enables companies to purchase ink and toner cartridges for printers and photocopiers which are not on a Midshire Managed Print Service. We are able to provide inks and toners for printers including: HP, Samsung, Konica Minolta, Xerox, Canon, Brother and many more, to support machines not purchased from us.